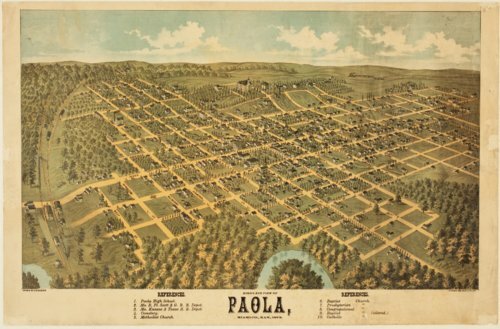 This colored lithograph is a bird's eye view of Paola, Miami County, Kansas. The references at the bottom identify the Paola High School; two railroad depots for the Missouri, Kansas and Texas and the Missouri River, Fort Scott, and Galveston; a cemetery; and several churches including an African American Baptist church. The business district is distinct but specific businesses are not identified. Steet names are shown. It was drawn by E. S. Glover and published by Strobridge & Co. Lithograph, Cincinnati, Ohio.